FC Halifax Town ended 2017 with a creditable 0-0 draw at high-flying Dover. Danny Clarke was sent-off late on for Halifax, who faced their second arduous away trip in five days after playing league leaders Macclesfield on Boxing Day, and produced another disciplined, resolute display. The Shaymen were short on attacking potency but there was no shortage of effort and commitment as Dover drew a blank at home for only the fourth time this season. To say the result was a hard earned point is an understatement, although it had 0-0 written all over it from the start. A back injury to captain Matty Brown meant Michael Duckworth made his first appearance since August 26. Both sides were quickly mired in lofting high balls forward that were too easily dealt with by the opposing defence in a dire first-half. Town’s rejigged back-line defended well though, with Duckworth slotting in seamlessly at right-back, and the team working hard to deny Dover any real sight of goal. But both teams were poor going forward, with no real spark or incisiveness about their play, although a poor pitch didn’t help. It took until 10 minutes before the interval for the first bit of goalmouth action, when Sam Johnson produced a fine double save to deny Mitch Brundle from long range and then keep out Ryan Bird’s follow-up. What little football had been played came from Halifax, with Michael Collins influential in keeping possession with excellent close control and and positional sense. Dover’s only option when in possession was to knock it long; if they had Tom Denton, it might have worked better. Halifax looked far more of a threat when they kept it on the ground, with Macdonald dangerous down the right. The winger was denied a penalty just before half-time when he was challenged by Femi Ilesanmi, much to Billy Heath’s frustration. Despite the dearth of excitement, 0-0 at half-time was job done for The Shaymen. It was marginally better from Dover after the break, with Giancarlo Gallifuoco heading wide from a corner. 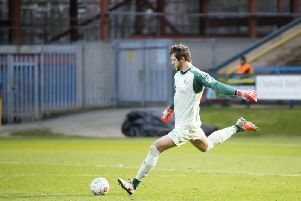 Denton’s header from Macdonald’s cross finally brought keeper Mitch Walker into action after an hour as the contest gradually started to open up. Bird drilled a shot wide on the edge of the box midway through the second-half, but Town still stood firm, putting in the hard yards and remaining resilient. Halifax tired towards the end, sitting deeper and deeper to protect the point - even more so when Clarke was dismissed for a second booking - but it never came under serious threat from an out-of-sorts Dover side. Dover: Walker, Passley, Essam, Ilesanmi, Gallifuoco, Parry, Brundle, Nortey (Bellamy 82), Pinnock (Alabi 77), Bird, Jeffrey (Daniel 12). Subs not used: Fazakerley, Deen-Conteh. Halifax: Johnson, Duckworth, Moyo, Garner, Wilde, Macdonald, Hibbs, Collins, Clarke, McManus (Tomlinson 55), Denton. Subs not used: Nicholson, Morgan, Waring, Oliver.